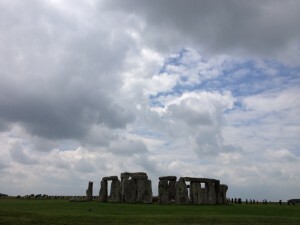 A new visitor centre opened at Stonehenge six months ago, in December, 2013. Its purpose was to “restore the dignity” of the monument. Mission accomplished? The A303 is one of the few major roads in Southern Britain that, in my opinion, is still a pleasure to drive. This is the alternative route from London to Exeter. It’s shorter than the M4 and M5, and doesn’t take much longer than the motorway, despite all the roundabouts. It’s a fine and scenic route, cresting the wide open Salisbury Plain, and climbing and speeding down the steep banks of the Blackdown Hills. But there is a place on this road, an ancient site, that elevates this to the status of one of the great journeys of the world. Just west of Salisbury, running down an incline, you see ahead of you a circle of grey, gaunt stones, massive, mysterious. We know it’s Stonehenge, yet the thrill is as immediate as ever. Imagine what it must be like to come across this fabulous place unexpectedly, as many people surely do every day. There were innocent days, not so long ago, when you could draw up, park your car and walk among these powerful stones, which were put up between 3,000 BC and 1,600 BC, and whose purpose we still don’t fully understand. As late as 1976 visitors could walk freely in the central circle, and even carve their names on the stones if the custodians weren’t looking. By then we were already well into the “what we do about Stonehenge?” debate. Last winter (2013) the authorities finally “solved” Stonehenge, in the practical sense of presenting it to visitors, with the opening of a spacious visitor centre well out of sight of the stones. (It’s on land owned by the National Trust, and administered by English Heritage.) I believe it does “restore the dignity” of the monument, as one of the speeches on opening day put it. This is what used to happen. You approached along the A303, then forked off to the north on the A344, which ran within yards of the outer stones. On the right was the old visitor centre, a 1960s facility designed for 100,000 visitors a year, connected directly to the stones by an underpass. You arrived very suddenly at this routine and uninspiring touristic pitstop, with no chance for a sense of mystery and wonder to develop. They did try to make the buildings blend in, but still they intruded. Even then, presciently, some observers suggested that the scheme could take an awfully long time. If delivering the London Olympics is a shining example of how to complete a project to impress the world in good time, Stonehenge qualifies as the opposite, a case study of drift, indecision and people with the power to make it happen simply not caring enough. Eventually the £27m project went ahead. The biggest relief to the site itself came from closing the A344 at its junction with the A303, grassing over the section that runs to the stones, and removing the old visitor centre. The new visitor centre, which makes no architectural reference to the stones, and is more like the structure of Woodhenge, a forest of 211 columns supporting a light structure, well out of sight of Stonehenge. It will gradually come into view and make its impact, as people climb the hill, either on foot or in a land train, or shuttle bus. In terms of sharpening anticipation and heightening awareness, the visitor centre is admirable. After you buy your ticket, the entry point is an exhibition space. In the opening room you stand in the centre of a “virtual” Stonehenge, as it was when it was complete. On display are 250 prehistoric objects – many previously unseen, and a reconstruction of an early Neolithic man. You will arrive at the stones well-informed, although they still keep their secret. On our visit, the last Saturday in May, the visitor centre was busy. By mid-afternoon there is a queue of six or more people at each ticket window. “Land trains”, strings of open trailers pulled by new Land Rovers, interspersed with minibuses, left every five minutes, via the now closed A344, up to a ridge, about half a mile away, and on to the stones. They are quite out of sight from the centre itself. So many visitors, but that didn’t stop a corn bunting from singing lustily on a fence next to the bus stop. At the top of the hill passengers are asked if they want to alight – by now the stones are coming to view – and continue on foot. The land trains stop by the site of the old visitor centre – on our visit they were still clearing away the remains of it – closed last winter. That space will be restored as grassland. You are still able to walk around the stones in a big circuit, with a firm path for part of the way, presumably for wheelchairs. People were picnicking on the grass. At first the stones seem too crowded for comfort. My unscientific count suggested a preponderance of overseas visitors, with many people from the Far East. My hunch is that many come in coach parties, probably from London, where they were staying, on day trips. Perhaps Stonehenge will join that rather hackneyed tourist circuit of Stratford, Chester and York. There were 1.2 million visitors in 2013, a 18.9% increase over the previous year. It will be fascinating to see this year’s figures. On January 14 (2014) English Heritage was reporting “huge” interest, with visitor numbers far exceeding previous years. There was an unfair, to my mind, rush to judgement by visitors on Trip Advisor just three weeks after the centre opened, with some brutal reviews over delays and queues. But the management, English Heritage, would have been equally dammed if nobody turned up. On my visit in May things seemed to be running smoothly. Let us review the visitor experience after a decent interval. One last word about reaching the stones. You have the chance to alight on the ridge and walk the last half mile along the traffic-free road. Or divert through a wood on the left and approached the stones over the open grass. This is the route we took back, keeping to the east of the wood and walking across the Stonehenge Avenue , something you were never able to do. An issue remains, and that’s for the future. What about the main road to the west, the A303, which still passes within meters of the stones, and is now – say local people – even more congested and slow-moving, possibly due to the closure of the A344? You could say that the road, the A303, should stay where it is, for the pure sense of wonder that view must inspire in so many thousands of people every week as they pass. And who knows how many children have been unconsciously set on a career in history or archaeology (or druidic studies)? On our visit, a busy summer Saturday in 2014, westward traffic was stationary several times as we circled the stones. I am sure many people in those cars would have agreed that there are few better places in England to be stuck in a jam. Then again, if Stonehenge stood in the middle of nowhere, miles from the nearest road, we wouldn’t dream of re-directing noisy, smelly and downright inappropriate traffic to run right next to it. There’s no hurry, but I think, in time, it should go. Stonehenge has a long future. I expect it will be at least 20 or 30 years before we talk seriously about the next stage, a diversion for the A303, or sinking the road in a tunnel. I’d like to think some politician will have the vision to see that project through. It will be difficult, in such an archaeologically-rich area. But I believe we must do it. Then, once again, one of the world’s prime historic sites will have the place of solitude it deserves.